Without seeming patronizing, West Towson, lies just “WEST” and within walking distance of downtown Towson. A collection of roughly 800 homes, homes for sale in West Towson maintains the similar characteristics of other Towson neighborhoods – walkeable tree lined streets with homes of vary styles and sizes. In addition to being close to downtown Towson, West Towson is home to the Towson Branch of the YMCA located on W. Chesapeake Ave.
One of the centerpieces of West Towson is the West Towson Park. Once the field and playground for the old Towson High School, the park offers something for everyone, including a baseball field, a basketball court, a playground for the kids, and picnic tables. Working to represent the interests of the community, The West Towson Improvement Association, comprised of of 100% volunteers, diligently works on issues that affect West Towson’s residents as well as furthering the strong sense of community among all of its residents by hosting movie nights, Easter Egg Hunts, clean up and tree planting days, just to name a few. 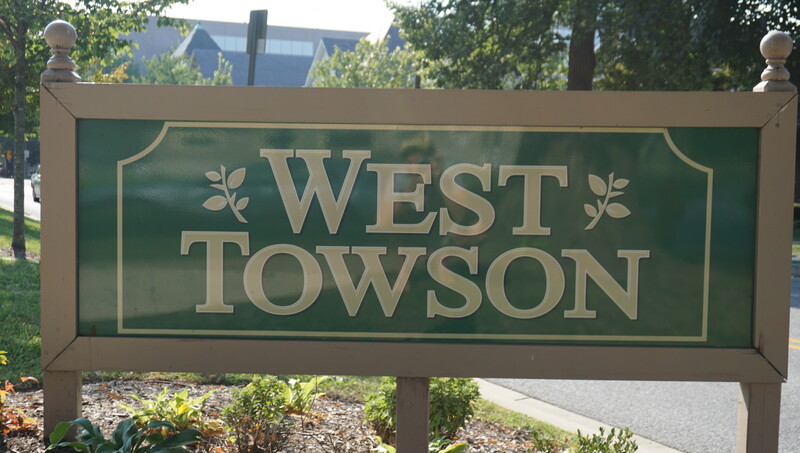 Ready to check out all that homes for sale in West Towson has to offer? If so, give me a call at 443-564-0952 or send me an email. I will be happy to create a free, no obligation automated home search for you that will deliver homes meeting your criteria directly to your email. Once you have identified the homes for sale in West Towson that you want to see we can schedule a visit. This is the house you've been waiting for! Spacious 4-bedroom brick colonial in sought-after Ruxton Ridge. Gorgeous landscaping and decks, light-filled house with huge rooms and hardwoods throughout first and second floors. Recently renovated kitchen is open to family room. Enormous dining room with French doors to two-level deck overlooking incredible perennial gardens. Amazing living room with wood-burning fireplace, built-ins (including a bar). Entrance hall is as large as a room, and the house is perfect for entertaining with a circular flow. Four large bedrooms on second floor. Master with walk-in closet and renovated bath. Three other spacious bedrooms and a renovated hall bath. Lower level is huge and features a built-in bar, loads of space, half bath, and a large unfinished area for storage. This house has it all! Walk to West Towson Elementary via walkway from the neighborhood. Style & convenience in W. Towson!~ Charming Colonial on private cul-de-sac across from Loyola HS.~ Enjoy the Master BR connected to private sitting room/office/nursery, Family Room opens to 2-level deck, fenced side/rear yard, 2-car attached garage, gas FP, partially finished basement, hardwoods, new roof, many other updates. Walk to Towson shops, restaurants and YMCA. Beautifully renovated home in the heart of west Towson is much bigger than it appears. Remodeled kitchen with 42 cabinets, a granite countertop, ceramic floor and new stainless steel refrigerator, stove and dishwasher. There are two full ceramic baths featuring beautiful tile work. The home has an abundance of natural light. The view from the living room and master bedroom is truly striking. Home features a formal living room with a stone wood fireplace. Kit side door leads to a covered porch with a swing, a stone patio is across the rear of the house which faces a tranquil private backyard. This custom rancher is one just waiting for you it is located in a Blue Ribbon School District in a highly sought after neighborhood - Close to downtown Towson, shopping and restaurants! This one won't last long! Ultra desirable West Towson Renovation! Home features 4 bedrooms, 3 full bathrooms and 2 car garage on corner lot. Open floor plan with large living spaces, stunning hardwoods, designer kitchen feathering quartz counters and stainless appliances. Upper level master suite with private balcony, finished basement and sunroom for ultimate relaxation! Across the street from the park, great proximity to all Towson has to offer and easy access to everywhere. Welcome home! OPEN HOUSES ON 4/6 AND 4/7 CANCELLED! Your search is over! Move-in ready beauty in coveted West Towson location. Owners are sad to leave! This house shows very well - gracious living room with built-ins and wood burning fireplace. Renovated kitchen with granite counters, stainless steel appliances & new refrigerator. Large finished basement with wet bar, extra refrigerator, full bathroom & tons of storage. Sunroom off kitchen w/new roof & siding. New carpeting on second floor. Hardwood floors, crown moulding, replacement windows & more! New HVAC and water heater one year old. Rear patio, large fenced yard & attached two-car garage. This property shows very well - you don't want to miss it! This classic West Towson home is a true beauty that has been carefully maintained for the next owner. The home has 1500 square feet above grade living area, three bedrooms, two full bathrooms and a study. The kitchen has been recently updated with quartz counter-tops, stainless steel appliances and trendy cork flooring. The original hardwood floors have been preserved for that Old World charm. There is a wood burning fireplace for winter entertaining and a screened in sun-porch for summer enjoyment. The basement has a fabulous rec room as well additional areas for storage. The large fenced-in backyard comes with a shed for even more storage. The upstairs study could be used as a fourth bedroom. Agent related to owner. The Seller is offering a One Year AHS Home Warranty.